Soccer is a sport that requires speed, strength, endurance and strategy, but it seems that good ball control in soccer requires also good grasp on physics. In this article, I will present a few basic laws in physics, and will show how these laws are reflected in soccer. Some of the facts may seem a bit trivial, but no one said physics lacks logic. According to Newton’s first law, if no force is applied to a ball, it will continue moving at the same speed and direction as it did before. When we put the ball on the grass it stays in its place, namely it stays in zero motion since no force is applied to it. However, after we kick the ball, it will continue moving in the direction we kicked at. Its speed will drop gradually, due to friction (a force applied to the ball in the opposite direction to its motion), but the direction of its motion will remain the same. According to Newton’s second law, a force applied to an object changes that object’s acceleration–namely, the rate at which the speed of the object changes. When we kick the ball, the force we apply to it causes it to accelerate from a speed of 0 to a speed of dozens of kilometers per hour. When the ball is released from the foot, it begins to decelerate (negative acceleration) due to the force of friction that is exerted upon it (as we observed in the previous example). If we were to kick a ball in outer space, where there is no friction, it would accelerate during the kick, and then continue moving at a constant speed in the direction that we kicked at, until it hits some other object or another force is applied to it. What is the difference in passing the ball by kicking it with the side of the shoe as opposed to doing a “toe kick”? Two things happen when we pass a ball by kicking it with the side of the shoe. On one hand, our ability to provide the ball with a strong momentum that will drive it to a far distance is relatively limited. On the other hand, we restrain the ball with our whole foot so that it cannot escape, causing it to move in the direction we were aiming at. When we toe-kick a ball, however, the kick is stronger but less accurate. The problem with the toe kick is that we give the ball a powerful strike on a small surface area – our toe. Whoever tried to play soccer barefoot on the beach clearly remembers it to be a painful experience. The difference between the toe kick and the side kick resembles the difference between stepping on a single nail and laying on a bed of nails. In the first scenario, the force of our weight is focused in one spot; while in the second, it is distributed over a large area, which is less painful. Is it important where we hit the ball in a “toe kick”? Of course it is! Kicking at the center of the ball will send it moving in a straight line, and it will roll on the grass until friction causes it to stop. Kicking at any other area of the ball will cause it to spin on its axis, according to the location of the kick. Kicking at the top part will cause the ball to spin forward, and kicking at the bottom part will cause it to spin backward. In any case, within a short time, the force of friction exerted upon the ball by the grass will cause it to spin forward. 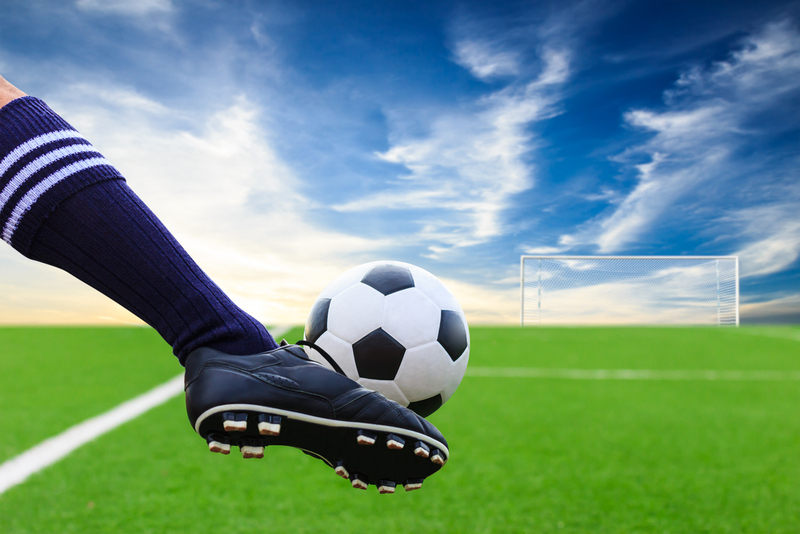 What is even more interesting is what happens when we kick the ball at its side– it begins to spin around in its place according to the location of the kick. If we kick the ball at the side and a bit towards the bottom, a wonderful thing happens: The ball rises up in the air while spinning on its own axis. In the beginning it will fly exactly in the direction of the kick, and as it slows down due to friction with the air, the spinning motion will cause the air on one side to move faster than that on the other side. The ball will then change its direction and will turn either left or right, depending on the side we kicked the ball at. This is called the Magnus effect, more commonly known as a “banana kick”. Another example for this is given by a player in another game: In what seems a nearly impossible move, a ball kicked from the side of the field, at an angle of almost 180 degrees with the goal, still manages to get in. In this case, as before, the player kicked the ball very strongly, with a side spin, which turned an almost completely flat kick into a banana kick that scored him a goal. Could a strong-enough banana kick make the ball complete a full round and return? Sadly no. No matter how strong and acurate the kick is, as the ball moves through the air the friction slows it down, causing the radius of the turn to become smaller and smaller. The ball can theoretically go in smaller and smaller circles, but in order to do that it has to spin extremely fast around its axis. much faster than any human play can kick it..
Why do players kick the ball high in order to score a goal from a long distance? According to Newton’s second law of motion, a force applied to an object causes it to accelerate. Once the force is no longer applied it stops, and a force opposite to the direction of motion causes the object to decelerate. When a player kicks the ball high, he applies a force on the ball that causes it to accelerate to a high speed. The moment the ball leaves the foot, it stops accelerating, and from this point forward only two forces are exerted upon it: the friction with the air, which slows the ball’s motion, and gravity, which pulls it down. As the ball moves, it slows and falls down. In order for the ball to enter the goal without falling to the grass, it needs to be kicked high enough for it to reach the goal above grass level. This means that what you see in cartoons, with a player kicking a ball strong and forward across half of the field, is a very complicated task to perform. If I want to pass a ball coming from another player to a third player, where should I aim at? When I want to pass a ball on, what would happen if I kick the ball straight towards the third player, without stopping the ball first? The ball would continue moving in the direction that the player who passed it to me was kicking towards, and the additional force I would apply to it would cause it to slightly shift diagonally, ending up somewhere between its original path and the location of the third player. Conversely, If I were to kick the ball diagonally in the direction of the player who passed it to me, the sum of directions would cancel out, and the ball would move straight towards the direction I was aiming at. Another option, of course, is to simply stop the ball and the pass it on. This is demonstrated in the following illustration. What is the difference between parrying the ball and catching it at the goal? Energy is the potential to create work or force, which is manifested in motion, heat, etc. Energy never disappears, but rather transfers from one object to another, and from form to form (from motion to heat and so on). As the ball reaches the goalie at a high speed, he has two options – either catch the ball with his two hands and block it with his body, or parry it with his hand. The ball reaches the goal with a large amount of energy of motion. Due to the law of energy conservation, that energy cannot be lost, but must transfer onto another object or transform into a different form of energy. Due to the high energy of the ball, parrying it with the hand might be a painful experience, since the energy of the ball is absorbed in the palm of the hand (a small area), and some of it is reflected back onto the ball when it is released in another direction. For this reason, many goalies prefer parrying the ball with their fist– it is simply much less painful. In contrast, when a goalie catches the ball, he stops it with his body and absorbs its energy, and with a strong enough kick, he will be pushed back. For this reason, goalies sometimes lay on the ball or roll with it– this way they have better control over the large amount of energy coming with the ball, thus preventing it from entering the goal. Why do soccer players wear cleats? In contrast to other ball games, soccer is played on grass. Grass is a very smooth surface, but also one that generates a lot of friction with the ball. As the ball rolls on it, the grass stems rub against it and slow it down. If it were an asphalt or parquetry field, it would be a completely different picture. The players, however, are much less affected by the grass, and even encounter the opposite problem: they might slip on the grass. The cleats in the shoes stick thesoccer players' feet into the grass, and prevent them from slipping. This is not the only role the cleats play. Since the cleats stick into the ground instead of having the entire foot step on it, they allow the players to run faster. The same goes for the cheetah, which sticks its claws into the ground, running almost on its nails. This reduces the cheetah’s friction with the ground, allowing it to spring forward. Finally, according to Newton’s third law, every force has a force that is equal to it in the opposing direction. This is what prevents us from sinking into the ground when we stand on it, helps us run with cleats, and what causes a ball to become squashed as it hits a player in the face. That looks like it has got to hurt, right? Davidson Online works to provide scientific information only, and is by no means intended to replace medical or nutritional counseling. Parts of this article must not be quoted without citing the article in its entirety.